$100 Gift Certificate for any of our products or services! Use it for a guided tour for friends or family, educational programs for your favorite teacher or anything on our webstore. Free postage in USA. 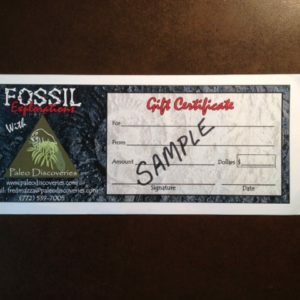 $95 Gift Certificate covers 1 adult fee for canoe fossil tour. No expiration date. Free postage in USA. $75 Gift Certificate for any of our products or services! Use it for a guided tour for friends or family, educational programs for your favorite teacher or anything on our webstore. Free postage in USA. $25 Gift Certificate for any of our services or products! Use it for guided tours for friends and family, educational programs for your favorite teacher or anything on our webstore. Free postage in USA.